The Sant Nirankari Charitable Foundation organized a blood donation camp at Sant Nirankari Satsang Bhawan Zirakpur. 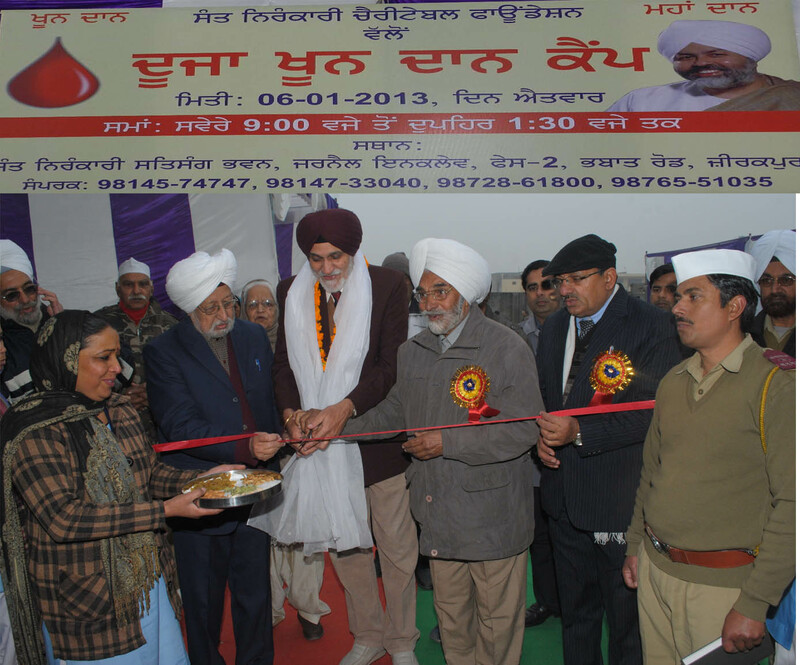 In this camp 145 units blood was collected in which 43 ladies also donated blood. The camp was inaugurated by Brig. P. S. Cheema, Member Incharge, Medical and Social Welfare, Sant Nirankari Mandal, Delhi. He said, “Sant Nirankari Mission is a spiritual Mission which provides God knowledge to all man kind and also contributes to social activities as well.”Elaborating about the Blood Donation Camps he said that the chain of these camps was started in the year of 1986, in which the Nirankari Baba Hardev Singh ji Maharaj had said, “The blood should flow in veins not in drains.” In obeince of His direction, the Nirankari devotees are donating blood regularly. Brig. Cheema added further. The Mission is also contributing in social services likes tree plantation, cleanliness drives, training in Tailoring & Embroidery, Charitable Dispensary, providing help in Natural Calamities also. Speaking on the occasion, Zonal Incharge Chandigarh Zone Dr. B.S. Cheema ji said till date 17 blood donation camps have been organized in the Chandigarh Zone, thanked all donars as well as Doctors and other officials of Govt. Medical College and Hospital, Sector 32 and Govt. Hospital, Sector 16, Chandigarh. Master Jaswant Singh, Mukhi Zirakpur thanked all the donars and Seva Dal Volunteers who arranged this blood donation camp under the supervision of Sh. Shubh Karan Ji, Khetariya Sanchalak, Dera Bassi.Sh. Deepinder Singh Dhillon, Chairman Distt. Planning Board, Patiala, Sh. Kulwinder Sohi, Chairman Municipal Committee, Zirakpur, Sh. Jaspal Singh, Ex. Sarpanch, Zirakpur, Sh. Harinder Mangat, Distt. Youth President, BJP (Mohali) also graced the occasion by paying their special visit in this blood donation camp.